As heroes need rivals, winners require competitors. Champions stay on top only when challenged. The status quo in any area of human endeavor lasts only when staving off oncoming alternatives. While change comes eventually—whether gradual or abrupt, graceful or under siege—habit, doctrine, or tyranny often stall its advent, and when change does come, it is often less than complete. Historic practices and traditional principles underpin progress with lingering connectivity: What’s best from the past informs progress or even pulls it back from misguided tangents when the test of time delivers a failing grade, like elevated highways slashing the urban fabric only to be cursed later as killers of community. The stakes of such successive challenges to established orthodoxy are especially high in architecture, the most public of artistic disciplines. Shifting design solutions shape the bedrock business of construction and the lives of end users regardless of the relative awareness of polemical origins. Along the way, land-use regulations and profit seek to play their according roles, making change all the tougher. Yet the effort proves pleasurably worthwhile as a way to chronologically measure two legendary careers, enhanced by their silver-tongued exchange of competing visions. A shared penchant for righteous control loosened as their long careers unfolded, if more in deeds than in words. Theirs proves an oddness of mutual gain. 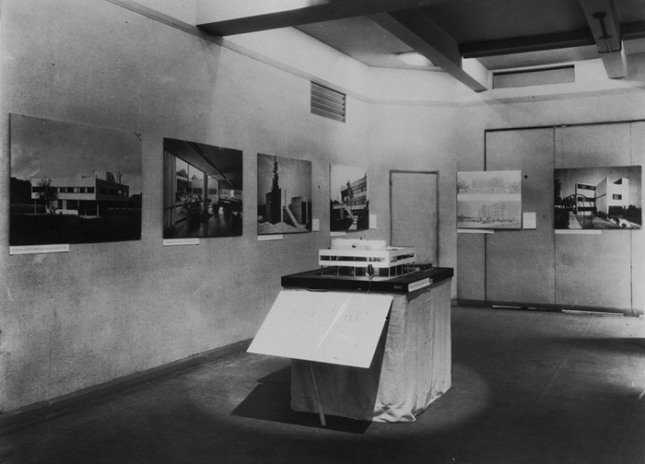 Their rivalry’s defining crucible, as Howard reveals it with justified relish, is MoMA’s fabled 1932 Modern Architecture: International Exhibition, organized by the precocious (and independently wealthy, thereby prematurely well-connected) 26-year-old Johnson, along with certifiable scholar Henry-Russell Hitchcock. In a none-too-soon nod to the European upheaval in design, museum founder Alfred Barr gave the go-ahead, asking only for some trace of American participation. 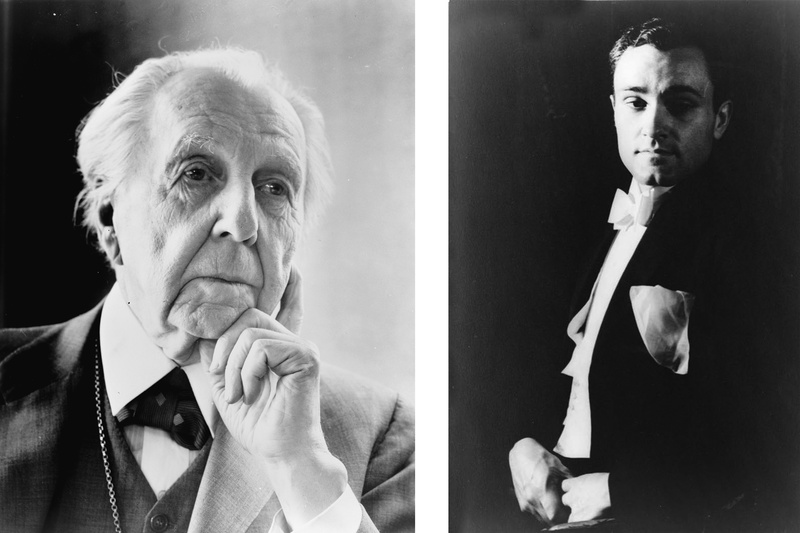 Despite joint skepticism and caustic distrust, Johnson and Wright finally cooperated with a never-built plan called “House on the Mesa.” MoMA visitor traffic received a boost from the inclusion of the best-known stateside practitioner, and an inspired Wright emerged newly invigorated, with the modernist masterpiece of Fallingwater carrying straight through to the final assignment of the Museum of Non-Objective Art (the Solomon R. Guggenheim Museum). The currency of polemical sparring started to pay rich creative dividends for all, no less than for Johnson himself who emerged as America’s official boy genius of design connoisseurship. 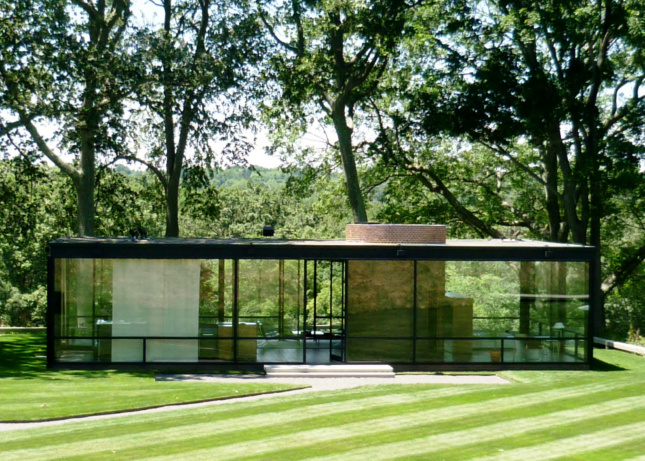 After his German flirtation with fascism and architectural studies at the GSA, Johnson took his place as Wright’s closely watched rival practitioner as well as critic, with his 1949 Glass House in New Canaan and the philosophical crossfire that it refreshed, according to Howard. Like the interpersonal artistic skirmishes enlivened recently by Sebastian Smee in The Art of Rivalry, attention should be given to a book that offers such engaging access to architectural theory and its visible results as sources for future impulse.